Was up early, went out and got the Sunday Papers and it’s a beautiful morning out! Had a light Breakfast, a toasted Healthy Life Whole Grain English Muffin topped with Smucker’s Sugar Free Blackberry Jam. Did my morning workout and went to Kroger for a few Produce items, Potatoes, Asparagus, Herbs, and such. Back home and got the Cordless and Light Leaf Blower out and gave everything a quick sweep. I love this thing, beats using broom outside! For dinner tonight Crappie!! 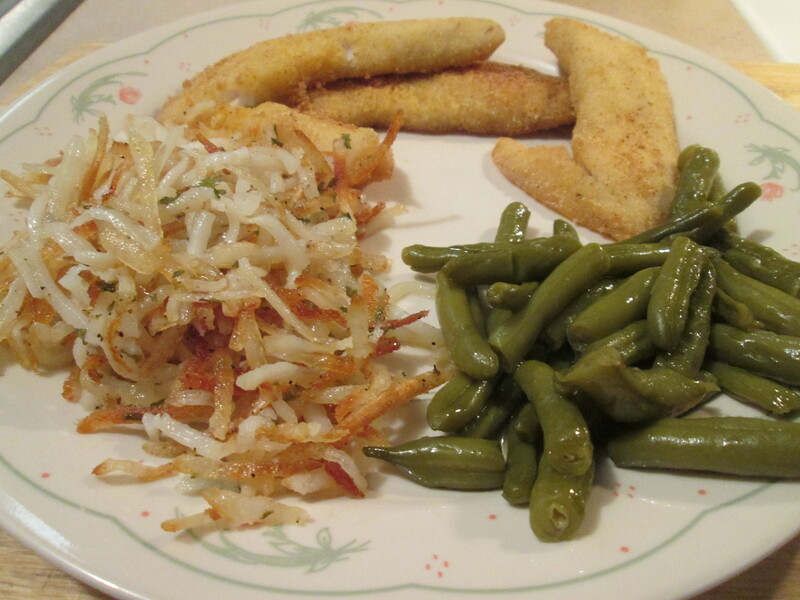 I’m preparing Fried Okeechobee Crappie w/ Hash Browns and Cut Green Beans. It’s my first Crappie Dinner of the year! Yesterday My Mom’s cousin and her husband brought me my annual supply of Okeechobee Crappie, or Specks as they call them in Florida! I couldn’t wait to have these so I laid a couple of bags out in the fridge overnight to thaw. To start I rinsed the fillets off in cold water and patted dry with a paper towel. 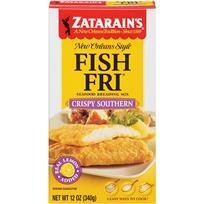 I then seasoned them a bit of Sea Salt and then rolled them in Zatarain’s Crispy Southern Fish Fri Breading Mix. Pan fried them in Extra Virgin Olive Oil about 3 minutes per side.As always they came out Golden Brown and delicious! 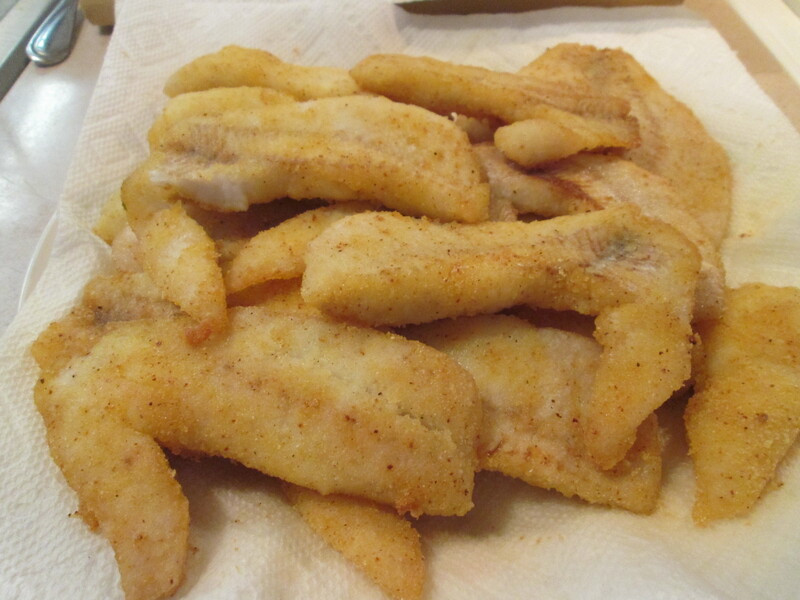 It’s hard to even describe how much I love eating Crappie, especially the Lake Okeechobee Crappie. 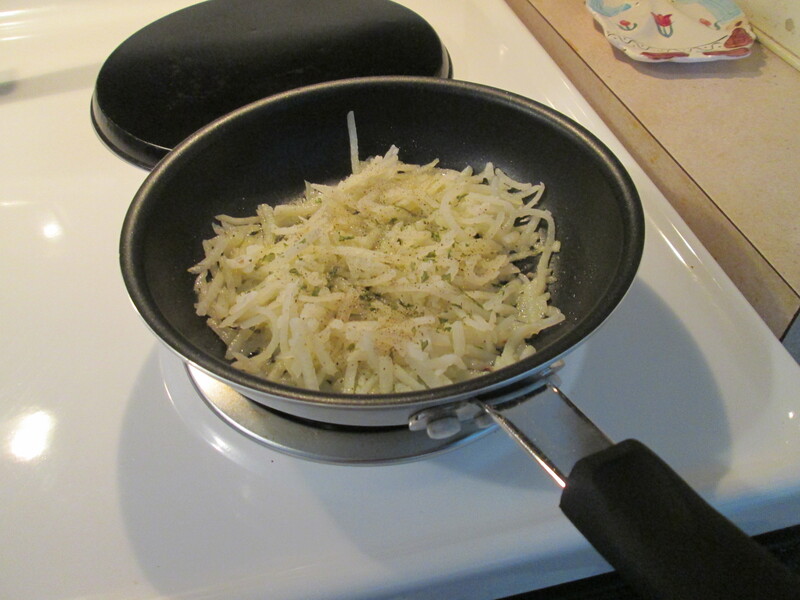 To go with the Crappie I prepared some Hash Browns, Potatoes are perfect with Fish. I always use Simply Potatoes Hash Browns. Fried in Extra Virgin Olive Oil and seasoned them with Sea Salt, Ground Pepper, and Parsley. Then I heated up a can of Del Monte Cut Green Beans, Green Beans go well with any meal as far as I’m concerned. Green Beans was my favorite Vegetable growing up even. One fantastic Crappie Meal tonight, but my last for a while. For dessert later a SO Delicious Dairy Free Coconut Milk Mini Ice cream Sandwich, one of my new dessert favorites. Made with Coconut Milk and only 80 calories and 12 net carbs per serving (1 Mini Sandwich). Slowly becoming one of my favorites, Shrimp and Scallop Gumbo! Added an extra ingredient this time, I added Craw Fish Tail Meat. It made a great Gumbo just a little bit better! I made a huge pot full. Enough for leftovers for tomorrow and also to freeze enough for a couple of servings. I listed the recipe below. *Fry Bacon and set aside when done. *Empty half of the Red Pepper Packet into the Gumbo. Put remainder aside. *Reduce Heat , Cover and simmer for 18 minutes. Meanwhile quarter the Sea Scallops, peel the raw Shrimp, and crumble the Turkey Bacon. *Taste, and if desired, add remaining Red Pepper from packet and Sea Salt. Add the Shrimp, Scallops, Crawfish, Crumbled Turkey Bacon, and Potatoes. Cover and continue to simmer for 7 more minutes.